The Obama White House is competing more successfully with press photographers than any previous administration,  four members of the White House News Photographers Association said Jan.20, the first anniversary of Obama’s inauguration. 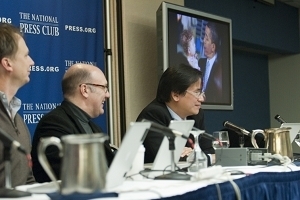 Through dozens of daily handouts of photographs to newspapers and wire services and its Flickr page where it uploads hundreds of photographs every day, the White House is seeking to control the images of the president it wants the public to see, the panelists agreed during a discussion organized by the Photography Committee. Kraft and the other photographers said they were perplexed and deeply troubled by the widespread acceptance and usage of the official White House photographs by media, including the Washington Post. “The Washington Post wouldn’t have used White House press releases, so why are they using White House photos?” he asked. Charles Dharapak, the Associated Press White House photographer for seven years, said the Obama administration's efforts to stage manage photographs began early, with the White House providing the sole coverage of the president being sworn in for a second time by Chief Justice John G. Roberts Jr., after the two mixed up their words during the official swearing in ceremony during the inauguration. “When newspaper editors use handout photographs, it undermines their own photographers,” he said.